EXAUDI is one of the world’s leading vocal ensembles for new music. 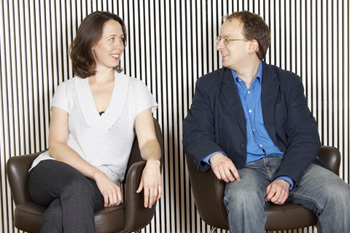 Founded by James Weeks (director) and Juliet Fraser (soprano) in 2002, EXAUDI is based in London and draws its singers from among the UK’s brightest vocal talents. EXAUDI’s special affinity is for the radical edges of contemporary music, at home equally with maximal complexity, microtonality and experimental aesthetics. The newest new music is at the heart of its repertoire, and it has given national and world premières of Sciarrino, Rihm, Finnissy, Fox, Posadas, Oesterle, Crane, Eötvös, Ferneyhough, Gervasoni, Skempton, Ayres, Pesson, Poppe, Mažulis and Fox among many others. Through its commissioning scheme, EXAUDI is particularly committed to the music of its own generation, and is proud to champion the work of significant voices including Aaron Cassidy, Evan Johnson, Bryn Harrison, Amber Priestley, Matthew Shlomowitz, Joanna Bailie, Cassandra Miller, Andrew Hamilton, James Weeks and Claudia Molitor. EXAUDI is also strongly involved with the emerging generation of young composers, and regularly takes part in composer development schemes and residencies such as SaM Portfolio, Voix Nouvelles Royaumont, IRCAM Manifeste Academie and Aldeburgh composer residencies, as well as workshops at universities and conservatoires throughout the UK. EXAUDI has particularly strong links with the Guildhall School of Music & Drama and City, University of London, where it is an Ensemble in Residence. EXAUDI’s many international engagements include Wittener Tage, Darmstadter Ferienkurse, Musica Viva (Munich), Muziekgebouw (Amsterdam), IRCAM (Paris), Festival d’Automne (Paris), Voix Nouvelles (Royaumont), Pharos (Cyprus), Musica (Strasbourg), MAfestival (Bruges), CDMC (Madrid), MITO Settembre (Milan/Turin), Fundaciò BBVA (Bilbao) and Quincena Musical (San Sebastiàn). The ensemble has also collaborated with many leading ensembles including musikFabrik, Ensemble Modern, L’Instant Donné, London Sinfonietta, BCMG, Talea (NY) and Ensemble InterContemporain. EXAUDI has appeared at many leading UK venues and festivals, including Spitalfields, BBC Proms, Aldeburgh, City of London, Bath, FuseLeeds, Manchester International Festival and Huddersfield Contemporary Music Festivals, Wigmore Hall, Café OTO, Kings Place and South Bank. EXAUDI broadcasts regularly on BBC Radio 3 and European radio stations, and has released eleven critically acclaimed recordings on the NMC, ÆON, Métier, Winter&Winter, Mode, Confront and HCR labels. Their recent recordings of Gérard Pesson’s Cantate = Pays and Michael Finnissy’s Cipriano, Tom Fool’s Wooing, Kelir and Gesualdo: Libro Sesto will be released in 2018-19. Future projects for 2018 include residencies at Time of Music (Viitasaari Finla), Voix Nouvelles (Royaumont) and hcmf, and recordings of Jürg Frey, Gesualdo and Sciarrino.